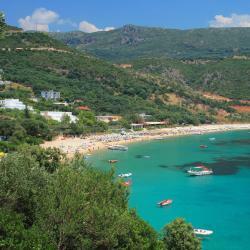 Looking for hotels near Sarakiniko beach? Just 164 feet from Sarakiniko Beach in Sarakiniko Area, Rizos Studio Sarakiniko offers a garden with a sun terrace. They feature air-conditioned accommodations with a balcony. Anessis provides beachfront accommodations in Sarakiniko. Featuring a shared lounge, this property also provides guests with a terrace. Both private parking and free WiFi are accessible on site. Anemolia Parga Suites in Sarakiniko provides accommodations with an outdoor swimming pool, a garden and a terrace. The property features a bar, as well as a restaurant serving Greek cuisine. Filoxenia Sea View offers self-catered accommodations in the village of Anthousa in Parga. Encircled by Mediterranean gardens, it offers a panoramic view to the Ioanian Sea. Located 1.2 mi from Alonaki Beach, Green Hill features free WiFi access and free private parking. Rooms are fitted with a flat-screen TV. A terrace or balcony are featured in certain rooms. Fantastic apartment with a fireplace, which was very welcome after a day of cycling in the rain. Surrounded by a lush garden with olive trees, Hotel Valtos is just 82 feet from Valtos Beach with a beach bar-restaurant. Great location. Beautiful large rooms. Very clean. Located in Perdika, only 328 feet from Arrilas beach, Sunset Apartments offers amenities including barbecue facilities and a garden. Free WiFi is at guests' disposal. Many thanks to our host who made us feel like home! Located in Parga, Alfa Hotel has a garden, terrace and free WiFi. Featuring a shared lounge, this 4-star hotel has air-conditioned rooms with a private bathroom. Offering a restaurant, Selini hotel is located in Loutsa. Each room here will provide you with a TV, air conditioning and a balcony. Private bathroom also comes with a shower. Selini Hotel is a gem, on top of a small hill, facing the sea. Surrounded by olive and cypress trees, Villa Rossa is just 66 feet away from Kryoneri Beach and 492 feet from the center of Parga Town. The property features its own beach bar and restaurant. Overlooking the endless blue of the sea, Domotel Agios Nikolaos is located in the lush area of Sivota. Offering a beautiful sun terrace and outdoor pool, as well as free wireless internet access and complimentary continental breakfast, Ammos Bay Hotel is a short walk from Ammoudia’s sandy beach. 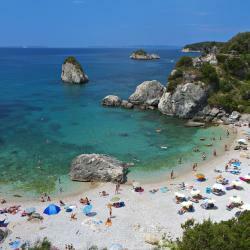 Centrally located in Parga, family-run Hotel Galini is a short walk from the beach and offers free Wi-Fi and breakfast. Hotel is in good location, near beach, tavernas, restaurants. 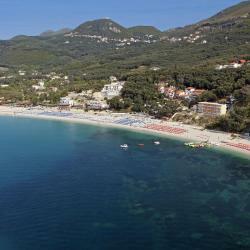 Hotels with great access to Sarakiniko beach! At the entrance of Parga's historical center, close to a few bars and restaurants, Dracos Hotel is ideal for a peaceful break. Located in Ammoudia, Hotel Alexandros features a seasonal outdoor swimming pool, shared lounge and free WiFi. Featuring a bar, the 3-star hotel has air-conditioned rooms with a private bathroom. The villa is great, very clean and quiete. Located 66 feet from the private, decked beach and 984 feet from Bella Vraka Beach in Syvota, Costa Smeralda offers a hot tub, a sea-water pool and a poolside bar. Location of the property is the best in Syvota. Set amid lush greenery, 1969 feet away from the center of Syvota, Hotel Villa Marie has a large swimming pool with sun beds and a pool bar. Hotel San Nectarios is a modern hotel in the center of the authentic Greek town of Parga, just 656 feet from the picturesque harbor and 2 excellent local beaches. The Venetian Castle is 2297 feet... Great room. It is new, clean and it has amazing view with a great wifi signal. Located in the seaside town of Sivota 2625 feet from the beach, Hotel Sivota is set within a big garden featuring a swimming pool and a tennis court. Centrally located in Parga, 1312 feet from Krioneri Beach, Hotel Torini features a bar and air-conditioned rooms with a balcony or patio. This was an excellent stop for us the staff and owner were both super friendly and helpful. Located at the center of Parga, Hotel Paradisos offers air-conditioned rooms with free Wi-Fi access. It has a swimming pool with a lovely sun terrace, a spa and a lobby bar. 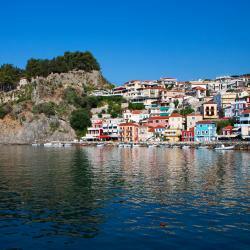 The proximity to the centre of Parga and the fresh and new decor. People are talking about Sarakiniko beach! Explore guest hotel reviews featuring "Sarakiniko beach"
Real honeymoon suite, not a gimmick! Close (by car) to one of the best beaches in the area: Sarakiniko beach. And, of course, the best of all: Mirta, it is your hospitality that made our stay so pleasant!